Temperature : Max. 38°C and Min. 36°C in Summer. Max. 21°C and Min. 19°C in Winter. Today, Madurai is the second largest city in Tamil Nadu. 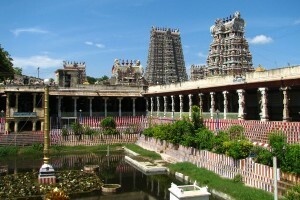 It is famous for the Meenakshi Temple with its towering gopurams and rare sculptures. Other important attractions include the sound and light show at Thirumalai Naicker Palace, Maraimman Tank, Koodal Alagar Temple and the Gandhi Museum. Nearby excursion include the Murugan Temple at Thiruparnkundran situated about 8 km away, Lord Alagar Temple at Alagarkovil is 21 km and Lord Subramanya Temple at Tazhamuthircholai is 4 km away above Lord Alagar Temple on a Hillock the Palani Temple that is 122 km, the Suruli Waterfalls is 128 km and Vaigai Dam is located about 68 km away. Across the border, in Kerala State is the famous Periyar Wildlife Sanctuary, which is 146 km away. Air: It is linked with Chennai and Munbai by Indian Airlines. Rail: Rail: Madurai is directly connected by rail with all the major cities of India. Road: Regular bus services connect Madurai to Chennai, Thanjavur, Pallani, Tiruchirappalli, Knyakumari, Tiruvanamthapuram, etc. Local Transport: Taxi, auto-rickshaws, city bus and cycle-rickshaws are available here. This entry was posted in Madurai, Tamil Nadu. Bookmark the permalink.